While driving, you cannot use a cell phone or similar electronic communication device while holding it in your hand. If the device is used in a hands-free manner, such as speaker phone or voice commands, that is legal but never while holding it. 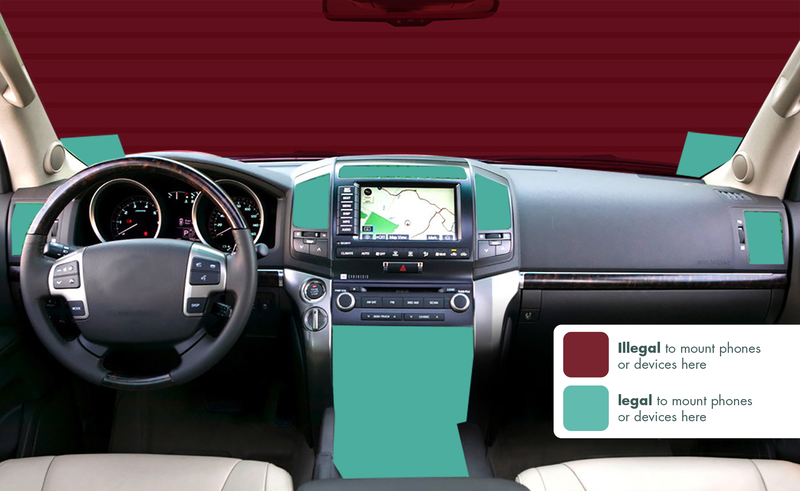 Using communication systems built into the vehicle by the manufacturer is legal. However, it still can be dangerous due to the brain’s inability to safely handle both driving and using in-dash or speaker phone functions. To be legal, the phone or device must be placed in a mount attached either on the dashboard, center console, or a seven-inch square section in the lower right corner of the windshield, or in a five-inch square section in the lower left corner of the windshield nearest the driver. The mounting or device placement cannot hinder the driver’s view. While driving, you can swipe or tap the screen one time while it is in the mount in order to activate or deactivate a feature or function. It is illegal to use multiple taps of swipes such as done while texting, entering information, or scrolling. A first offense ticket will cost at least $162, and at least $285 for a second offense. The law applies at stop signs and stop lights, just like when you are driving. Pull over to a safe parking space to handle your business. Drivers under the age of 18 may not use any mobile communications device at all, whether hands-free or hand-held. You may use a hand-held cell phone for true emergency purposes to call law enforcement, fire department, health care provider or other legitimate emergency services agency. Emergency personnel such as police, fire, ambulance and tow truck drivers may use hand-held cell phones, but only in the legitimate course of duty. Other serious driver distractions such as eating, grooming, reading, reaching for fallen objects, changing clothes and others are just as dangerous and can result in a ticket for “speed unsafe for conditions” or “reckless driving.” These infractions carry much larger fines, plus points against your driving record.